"Who put a magazine in my program book?!?" Hello world. Ready for something new? We thought so. Yes, it's our first issue and we have a few words on where we've come from and where we're going. Welcome to Ionfuse! It was a simple idea. And it's all Ben's fault. Here, for the Anime Reactor special, James asks the million dollar question, "Who put a magazine in my program book?!?" Mary must get her wings back from the Evil Angel Shion in order to help the people of the Earth. Come with us as we take a trip into the backissues of @anime! 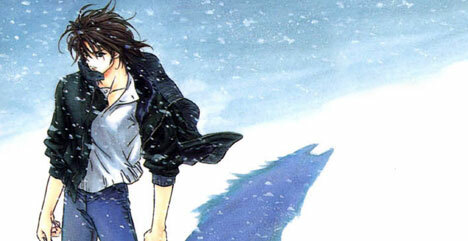 with a look at the PLEX Int'l manga with Angel's Wing by Aoki Tetsuya. Robin, Starfire, Cyborg, Beast Boy and Raven jump from the small screen into your comic book store! It's Teen Titans Go! from DC Comics. Get the 411 on all of the latest things coming from the world of video games as Michael takes us on a trip into the hottest place in the gaming scene, E3: The Electronics Entertainment Expo. Mikel takes us on a trip through the hallowed halls of his own personal Sector 7C. This time, we take a trip Inside the Toy Collection. Kamen Rider figures included. Come with us as the @anime! and Reactor crews head down to the San Diego Comic-Con International! The cameras were out in force. Here's what we saw. Commentaries are free. It's the latest thing from the mind of anime master Toshihiro Kawamoto. Wolves have been believed to be extinct, until one day they made a grand reappearance... What's the significance? Only you can find out in the hit series from BONES, Wolf's Rain. It brings fubar to a new high! Retro and Pandy take on the world and the lunar prison colony in the insane smash hit from the warped minds at Manga Entertainment and Gaijin Productions, Dead Leaves. Be very afraid. Take a look at the ultimate video game parody with one of the creators of the hit animation series based on the wildly popular Halo games. Gus from Rooster Teeth Productions gives us an inside look at Red vs. Blue. One of the best reasons to watch Record of Lodoss War is Deedlit. She's fun. She's fiesty. And she's always ready to kick some ancient backside. This time around, we have a guest to share her insights on Lodoss War and Deedlit from a cosplayer's point of view. It's the last place you'd look for mail... a place for us to share some of the latest incoming mail with all of our readers. Got something that you need answered? Got a burning question about your favorite anime or manga series? We'll select a few items to answer each month.. in the Dead Letter Office.